If you are one of the millions who regularly attend religious services, you are undoubtedly aware of the profound effect your church, synagogue, mosque, or temple has on your life. Your religious congregation is likely involved in celebratory occasions such as births, marriages, and religious holidays, as well as in times of misfortune, illness, or the death of a loved one. Therefore, it is important, to have input into the major decisions that your congregation makes. And it is even more essential to know your duties, responsibilities, and options if you are even peripherally involved in its management. 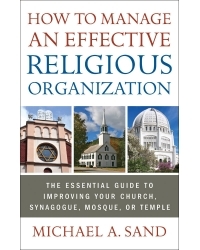 How to Manage an Effective Religious Organization will give you numerous ideas for improving your congregation, whatever its religious affiliation. Michael A. Sand heads Sand Associates, a nationwide management consulting firm based in Harrisburg, Pennsylvania. Founded in 1982, the firm provides comprehensive consulting and training to all nonprofit organizations. Mike has led more than 1,000 workshops for representatives of nonprofit agencies and municipal governments. Mike is the author of How to Manage an Effective Nonprofit Organization and The Essential Nonprofit Fundraising Handbook (both published by Career Press). He received a law degree from the University of Pennsylvania Law School, a master’s degree in Public Administration from Penn State, and a bachelor’s degree from the University of Pennsylvania.